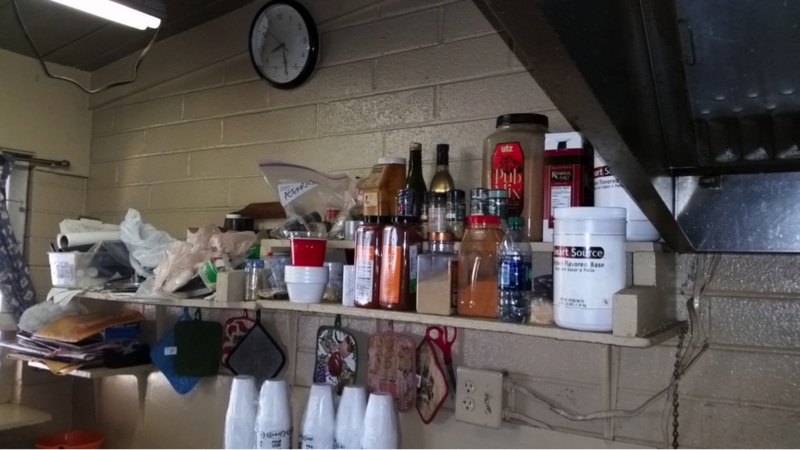 Volunteers from the Santa Catalina Catholic Parish have been working on various upgrades for the soup kitchen and house bathroom since early February. The church’s Social Awareness Ministry asked Brian Flagg if they could work on some improvements and Brian was enthusiastic for the help. We asked Brian what his primary need was; without hesitation he talked about the large stoves in the kitchen that needed to be replaced. The Santa Catalina team led by Sr. Jean Mariani and John Tancock inspected the kitchen with Brian and noted several areas that could be worked on in addition to the stoves. The stoves are used to make soup for 500 hungry people every day and indeed looked like they were in serious need of replacement. Brian was particularly concerned about the continuous burning pilot lights and the gas wasted. We researched replacement stoves and hired a plumber to inspect the gas supply for the replacement. There were two Wolf brand stoves, each having two burners, totaling four burners. (Each burner uses 110,000 Btu’s per hour which is nearly three times the gas used by a typical four burner range; total demand 220,000 Btu’s/hr.). 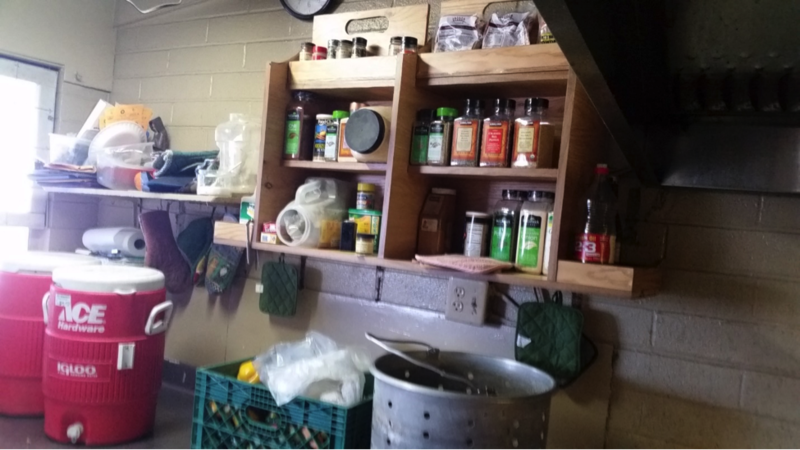 These stoves generate a tremendous amount of heat in a tiny kitchen serving hundreds of hungry patrons nearly 365 days a year. As it turned out, the stoves looked bad and had broken parts, but could be cleaned and refurbished easily and at a significantly reduced cost. The stoves are mostly steel, cast iron and a little tubing, so they are solidly constructed only needing “a little TLC” – hey, who doesn’t? One new stove of comparable performance retails for about $4,200. With Brian and Cesar Aguirre’s agreement, we decided to go the refurbishment route, repairing all four burners for about $900. In the process, we learned that the gas supply was severely undersized which may have contributed to the “flameouts” staff was experiencing. We hired a plumber to upgrade the gas supply, bringing it into compliance with burner requirements. Another priority on Cesar’s list was the sink and drainage system. On first inspection, the drains were leaking, with pots and pans on the floor catching the leaks. 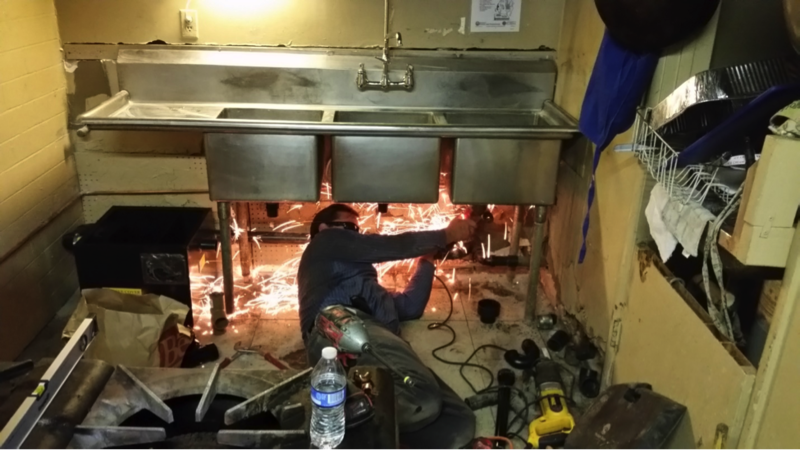 Casa Maria knew they needed a grease trap and sanitary sink arrangement. 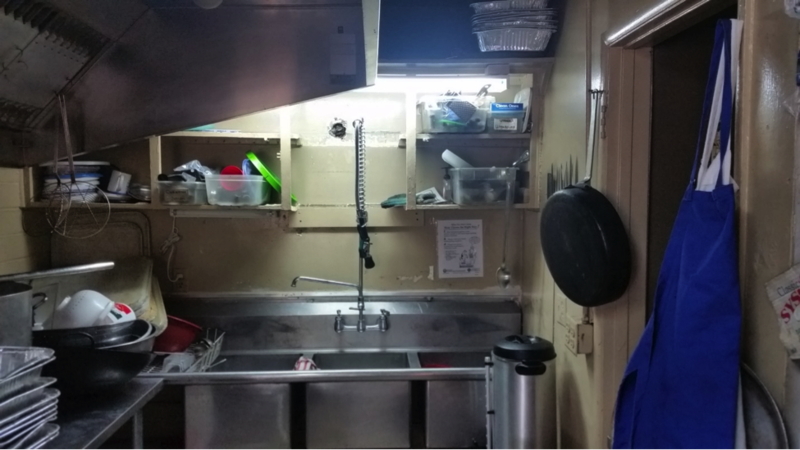 We explored replacing the sink with a new, larger three compartment arrangement that would accommodate the large (20” in diameter) pots, but the room was so small, it would not accommodate a sink any larger than what they had. We elected to add a trap and a sanitary drain using the existing three compartment sink. The soup kitchen is an amazing production. Staff and volunteers produce coffee, breakfast, soup, snack packs and family sacks for 500 or more people almost every day, all in the space of less than 600 square feet, all served in roughly three hours. 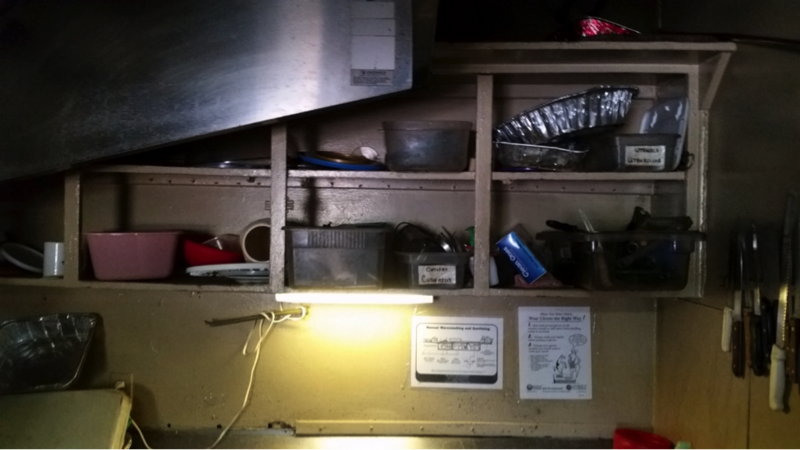 One area of focus that the Santa Catalina volunteers observed was this group of amazing people need a little help organizing their tiny workspace so they can do their job easier and more efficiently. To that end, additionally we looked at making their space more efficient with simple improvements, increased storage and improved lighting. The spices the cooks used were haphazardly stored on a shelf, near the cooking area, and not easily accessed. We built and stocked a custom spice rack to make this task a little easier. 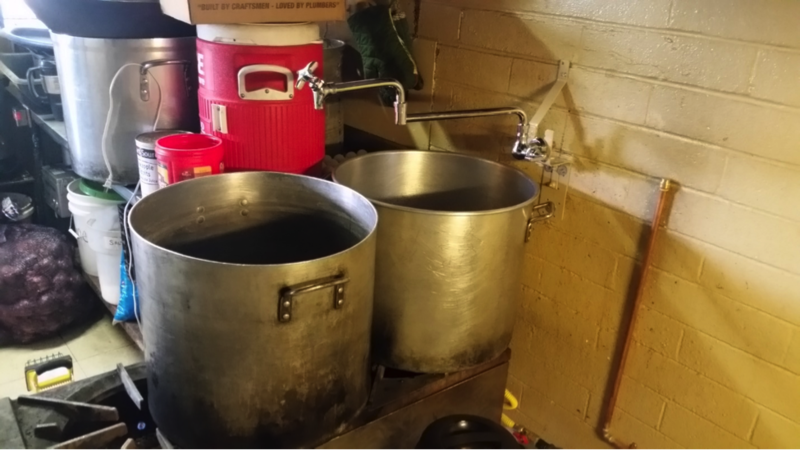 Another small, but helpful improvement was how the large (12 – 15 gallon) pots get filled with water to make large quantities of soup. Previously, staff would carry buckets from sink to pot. Now they have a dedicated water line and pot faucet over the stove that can fill the soup pots with little effort. Another small improvement was with new lighting for a dimly lit, small space. High efficiency lights were added in three rooms to dramatically improve workspace lighting. All in all, Santa Catalina managed roughly $10K in small and significant improvements of the soup kitchen and house bathroom since February. We plan to take mid-summer off and visit with Brian and staff late in summer to see what else can be improved. Our thanks to Brian, Cesar Aguirre, Lonny, Chad, Mayola, Cesar, Amalia, Jimmy, and Laura for their cooperation and input. Our apologies for the dust and inconvenience – we hope and pray you like the changes. We look forward to working with you again in the future. Editors note – Make no mistake, Casa Maria is extremely thankful for John Tancock and Santa Catalina Parish! Este blog post, por John Tancock de la Iglesia Catolica Santa Catalina en Oro Valley, es sobre sus fuerzas para arreglar y mejorar muchas cosas en la cocina gratis aqui. Casa Maria dice MUCHAS GRACIAS a John Tancock y la Iglesia Santa Catalina.